Our new amber incense recipe is massively oriental, with a gentle but intoxicating sweetness and sultry hints of musk and spice. An almost sensual scent, you'll fall in love with this uniquely evocative take on a traditional amber. Warming, exotic and vibrant. 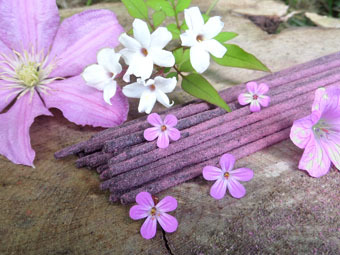 This incense is scented with labdanum resin, vetiver oil, patchouli oil, vanilla oil and sandalwood oil. 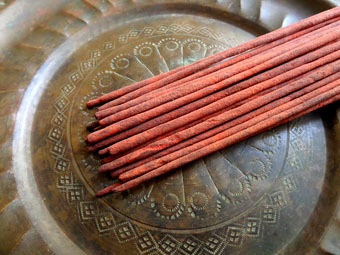 These ingredients are added to our all-natural incense base. This is made up primarily of bamboo charcoal (a very eco-friendly charcoal), sandalwood and vanilla powder, bound with resins and gums, like frankincense. 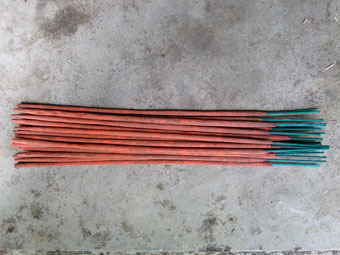 This is all mixed together by hand before being rolled onto thin bamboo sticks. Sometimes we dust the batch down with an organic dye for a little colour.